Contact Bonnie Czarnecki bonrosec@gmail.com or Mary Jo (Zimmer) Dey mjdey@bex.net to make sure we have your updated email/address info. 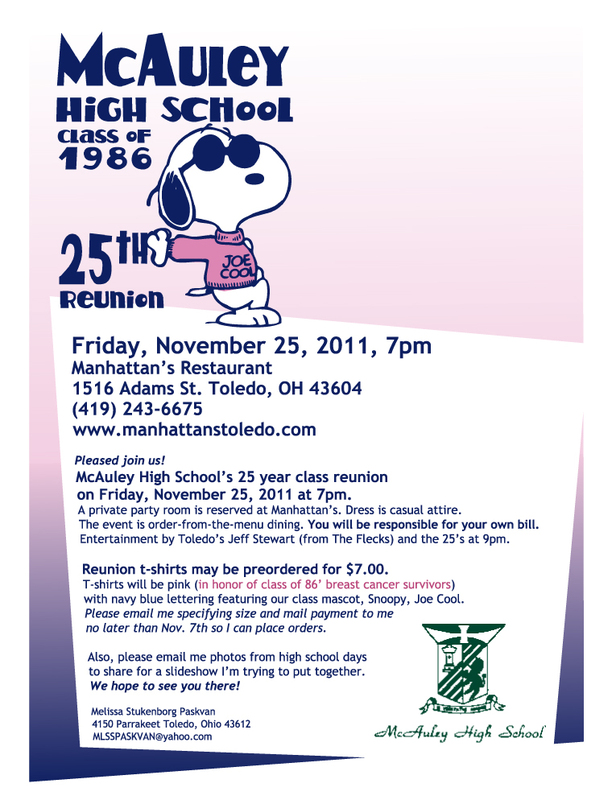 CLASS of 87 – 25th reunion…. June 23th 2012 @ 6pm. Please RSVP ASAP to Cheryl Jones Higgins @ 419-343-9538. Friday August 5 at 6:00 at LaScola Restaurant on Airport Highway. We have a room reserved and each classmate will pay for whatever they eat and drink that night. No cash up front, but we do need RSVP’s. Please contact Julie McKaig Danko at mcdanko@roadrunner.com ASAP to reserve your spot. Manhattans for lunch on July 31, at noon. If you have not already called or emailed please do so as soon as possible. If you cannot make Manhattans we do hope to see you for The Gathering at Our Lady of Perpetual Help Gym on August 28. Reservations for Manhattan’s or questions may be directed to Sr. Joanne Boellner at joannersm@bex.net or Mary Opaczewski at marasdolls@bex.net or 419-389-0603. Hope you can come – spouses/dates are welcome! The date, time and place has been confirmed. We just need you!!!! We have a private room that will accommodate seating for 50 people, separate checks, all on one level. LaScola is located at Airport and Reynolds Road, the “old” Bungalow. If by some chance we exceed 50, we may need to make other arrangements. I would be delighted to do so if need be!!!! Love to see you all!!! Old McAuley Highschool tour being coordinated for Saturday morning. Date: July 24th, 2010 at 6pm. Place: The Lighthouse on Broadway in Toledo. Cost: $16.00 per person. Dinner is included (taco bar) with a cash bar. Class of ’65 a Saturday lunch reunion at a local restaurant is in the planning. Please reply to Sister Joanne Boellner joannersm@bex.net or Mary Mercurio Opaczewski marasdolls@bex.net or 419-389-0603, with your choice of June, July, or August. Send your email address to Ronnie Pinciotti at vip33@bex.net so we can keep you updated. Class of 1980 – None being planned at this time. Need a Class Rep and/or reunion Chairperson. Please let us know if you are interested. Contact: McAuleyHighSchool@gmail.com . Feel Free to note in the Comments – your name and location in the pictures. 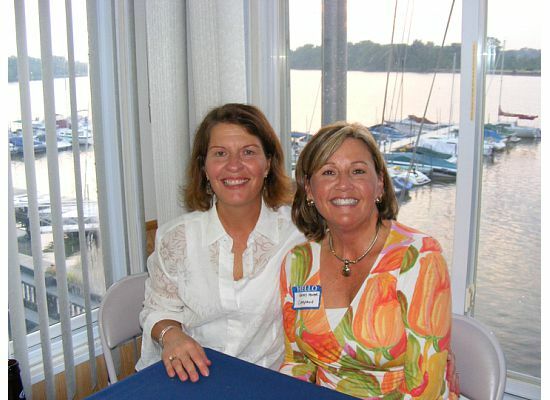 Class of 1979’s 30th Class Reunion held on Aug. 8th at the Perrysburg Boat Club with 29 grads along with several spouses and guests in attendance. 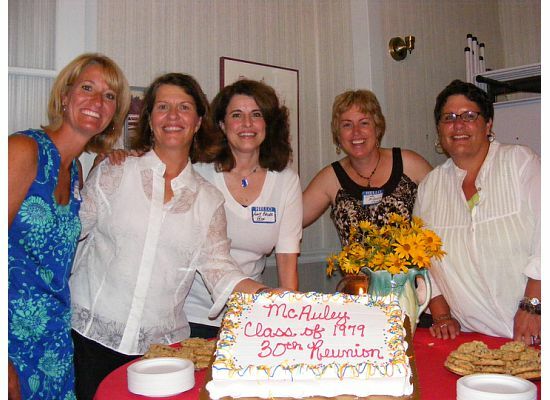 McHugh Branyan (class representative), Wendy Weston Held, Kathy Hower Campana and Mary Pat Arman Harms planned the reunion. Janice Leirer Braida provided the flowers and the beautiful table decorations. You can leave a comment by clicking on “comment” below. Saturday, June 27, 2009, Easy Street Café, downtown Toledo. A wonderful time was had by all and we were especially appreciative of Kathy Farkas’s traveling all the way from Prescott Valley Arizona, Jackie Elder traveling from Craryville (Hudson Valley), New York, Mary Pat Nahacky traveling from Franklin, Tennessee, and Michelle Alger from Benton Harbor, Michigan, to be with us. Karen Mundwiler came a little late due to another commitment, and missed the photo. With 28 in attendance that was nearly one-third of our graduating class. Jackie Strowger Elder, Colette Erford Leyland, Christine Best Keller, Deb Mitchell Ketzer, Paula Reid Richmond. Jane Nowacki Patrzalik, Linda Schuller, Paula Miller Straub, Mary Pat Leonard Nahacky, Mary Anne Moore Cullum, Pat Carroll Sweet, Sue Knurek Carew, Michelle Albrecht Alger, Mary Pat Suter Scroggs. Kathy Ehrman Farkas, Ann Queenen, Pat Jennings Spohn, Deb Muller Bunke, Beth Schlageter Johnson, Sharon Kaczala Fickel.